6th GATE / Cells | YayScience! Cells make up every living thing. You are made up of trillions of cells just like your dog. Each of those trillions of cells are like tiny cities that create power, clean themselves and create things. 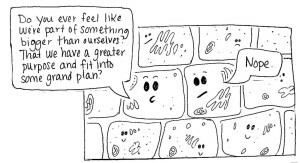 Your cells are amazing and we will learn how they work, what the different parts are and how they help you live your life. If you didn't have cells you would be dead so they are quite important.